For this month's "Maps of the Month" featurette, I wish to draw your attention to Grizzly's Lion King (Super NES) maps. Who hasn't heard of Disney's Lion King? In the 1990s, when it seemed like Disney was at their peak, it seemed like every year there was another big summer Disney animated film. The Lion King, released in the summer of 1994, was one of the biggest ones. And with each film - this one included - came a flood of merchandise, including video games. Normally I wouldn't have high hopes on games based on any movie, as the track record of movie-to-game translations is less than stellar, but Grizzly shows us that at least The Lion King game on the Super NES looks really good. What makes these maps particularly impressive is how Grizzly dealt with the backgrounds. As are the case of many Super NES maps, they scroll at a slower rate than the foreground, and so are actually "smaller". Grizzly has applied more gradient colours than in the original in-game images to allow the backgrounds to fill their space - and also making them looking better than in the actual game! This shows that an already colourful game can be mapped more vividly with an understanding of colour and more patience than what is already required to map any game. While some cartographic purists would usually frown on any alteration of a game's original graphics, no worries here (hakuna matata!) - the maps all look too good to gripe about. 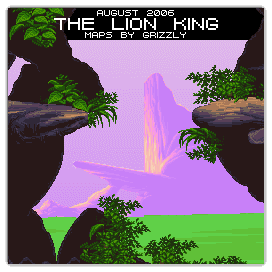 So to recognize the effort put into making these more-beautiful-than-in-game maps, Grizzly's Lion King maps will be known as VGMaps.com's Maps of the Month for August 2006. Sheesh...I finally break the habit of picking Maps Of The Month the night before by getting it ready a day before that, but then the site runs out of bandwidth and then it looks like I'm eighteen hours late anyway. Gaaah! And it's been a few days...no comments for Grizzly and his maps? Lions and grizzlies and lateness, oh my! Well, to be fair, we already commented a fair bit in the original thread for his maps. To me, it felt a bit, I don't know, redundent. I think you pretty much nailed why his maps look so great, specifically the gradiant alterations. I could add that he still used pixelated transitions between colors for his new backgrounds which is why they fit as well as the old ones. Had he used a simple color to color horizontal transition, it would have looked too pure and thus out-of-place.